There are lots of unique things you can do when you are visiting Marrakech. The many available Marrakech excursions help you to plan a perfect vacation for all involved. If you are looking for exciting day trips from Marrakech why not let us also help you with all the non-trip related things that you need to know while vacationing in Marrakech. We have an excellent selection of day trips to Essaouira, Ouarzazate & Ait Ben Haddou, the Atlas Mountains and Ouzoud Falls . These Marrakech day trips have been designed for you to explore the most impressive landscapes and places of Morocco. Here are the best Morocco excursions with daily departure from Marrakech. Here are the best day trips to take from Marrakech. Day trip to Ouarzazate is one of our most popular excursions. 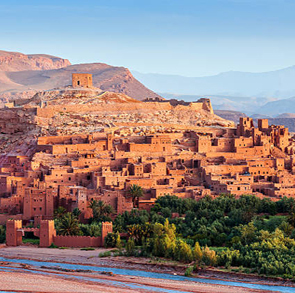 Take an adventure through the Atlas Mountains up to Ait Ben Haddou, a UNESCO World Heritage Site, where you will visit its impressive Kasbah, and stage for The Game of Thrones. At Ouarzazate, Morocco, on the cusp of the Sahara Desert, you will visit the ancient Kasbah Taourirt, a palace of 300 rooms, and the famous Atlas Film Studios. Follow the ancient trails of the Berbers through the Atlas Mountains, and travel to the past through the towns nestled in the valleys and mountains. Discover the traditional ways of village life in Morocco. You will behold majestic landscapes, and thanks to the 4x4, get to remote locations where tour buses cannot reach. 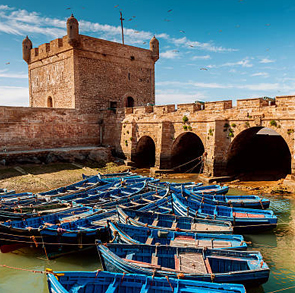 Discover Essaouira, the Moroccan Atlantic paradise and retreat of stars such as Jimmy Hendrix. On this excursion you will be able to tour the harbor and the walled-in enclosure of the Scala. Stroll along the lively streets, get to know local artists as they refine their craftsmanship, and, if you like fish, take the opportunity to enjoy a tasty meal by the port. Take a break and surround yourself with the thousands of olive trees of the Ouzoud Falls on this 1 day excursion from Marrakech. 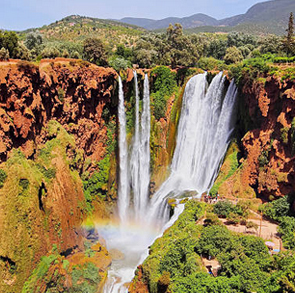 Accompanied by your guide, you will discover some of the most eye catching waterfalls of North Africa, located in Tanaghmeilt, in the Atlas Mountains. This area is in contrast to the sweeping, arid landscape of the country. 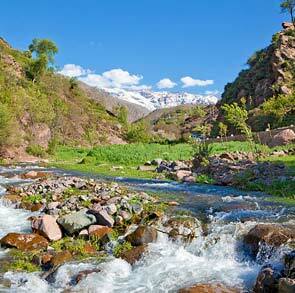 On this Atlas Mountains excursion, you will Discover the Ourika Valley, a lush oasis of greenery. Located in the foothills of the Atlas Mountains, Ourika is known for its amazing waterfalls, landscapes, striking roads, and beautiful traditional villages. You will visit an herb garden to enjoy traditional mint tea, offered by the local inhabitants. Enjoy Marrakesh your own way with this private excursion, discovering the many facets of this city. Walk through the labyrinthine streets of the Medina and its famous souks. Travel into the past by visiting the most beautiful palaces and monuments, such as the Bahia Palace, bustling Djemaa El Fna Square, or the Saadian tombs. Become a Tuareg for a day and take a camel ride through the Palm Groves of Marrakesh. With more than 100,000 palm trees; local villages; and the desert that surrounds it, the Palm Groves are a very magical area. For a unique perspective, follow the routes that attracted many trade caravans for centuries. 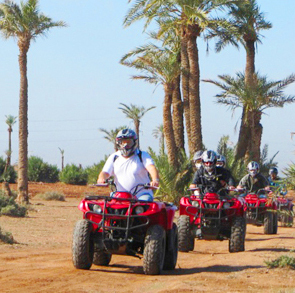 Enjoy the best activities during your trip to Marrakech. This is your chance to experience the Marrakech desert, combining speed and sand, in both Quads and buggies. You’ll feel the essence of Moroccan folklore at "Chez Ali," and enjoy a “Thousand and One Nights” show located in the Palm Grove of Marrakesh. Savor the delicious traditional food and enjoy a unique spectacle, with belly dancing, fireworks, horses, and incredible tricks that will leave you speechless! If you are on the lookout for great Marrakech excursions you will be able to find one here within a matter of minutes. We have an excursion here to meet every taste and every curiosity. All our tour guides are experts and they ensure that every tour they do is a worthwhile experience with time well spent. Our tours will have you immersed in Moroccan culture and life so much so that you will not want to end your vacation. You will not regret it when you choose from one of our day trips from Marrakech. 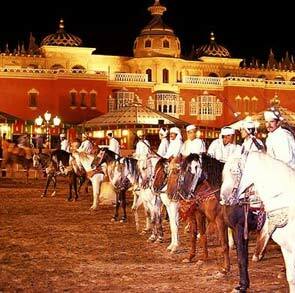 Here you can have the best sightseeing tours and desert trips from Marrakesh. Let the professionals take care of all the little details, while you just show up and enjoy yourself and savor in the moment. These Marrakech excursions will enable you to better know Marrakech and its tourist attractions. It’s possible to combine several destinations and make these two-day tours, spending a night in the chosen city. If you want to visit a city that is not included here is, don’t hesitate to tell us what city you would like to visit. We will review your proposal and you will receive a prompt response to your request. Choose from trips to The Waterfalls of Ouzoud to Ait Ben Haddou. Travel through the Atlas Mountains and so much more. 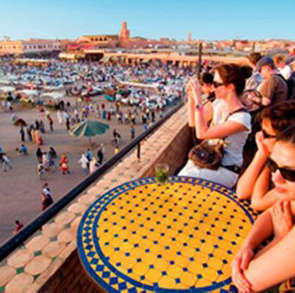 All of this and more await you if your book your Marrakech excursions with us. Let us help you make your visit to Marrakech an unforgettable one! Book your tours with us today to ensure the best experience for your vacation in Morocco.